It was so much fun doing a giveaway. I don’t plan to do one every week, but I will throw them in every once in a while, so be sure to check back. Now, on to this week’s MMGM. I was first introduced to Matt Myklusch’s Jack Blank series last year. While I was reading the first book, originally titled JACK BLANK AND THE IMAGINE NATION, from the library, I entered a contest for a signed paperback and won! I had it inscribed for my son, thinking he’d enjoy it when he’s older (he was only 3 at the time), but I should have had it done for my husband. Since we now had our own copy, I told him he should read it. He devoured it and the second book, THE SECRET WAR, right away. 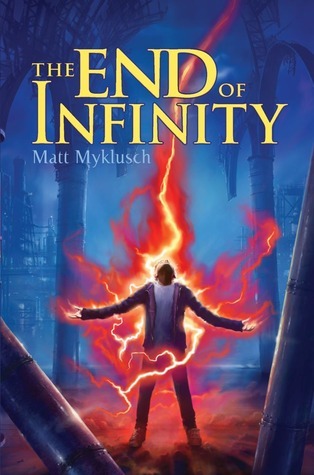 He hated having to wait for the final installment, THE END OF INFINITY, which came out in August. Since our first two copies are paperbacks, we requested the hardback from the library, and it took FOREVER! Anyway, because we both wanted to read it right away and had a bit of a road trip that weekend, I read about two-thirds of the book out loud to him. And how did he thank me? By grabbing the book when we got home and finishing it off himself. Oh well, I was only a day behind him. This review is going to be more of a series review because I don’t want to spoil the first two books for anyone. Here’s the description from the first book, THE ACCIDENTAL HERO. Jack Blank doesn’t even know his real last name. All he knows is his dreary life at St. Barnaby’s Home for the Hopeless, Abandoned, Forgotten, and Lost. But one morning a Robo-Zombie straight out of one of Jack’s favorite comic books tries to blow him up. Then he’s whisked off to a secret country called the Imagine Nation–a magical place where all things fantastic and unbelievable in our world originate, including Jack. 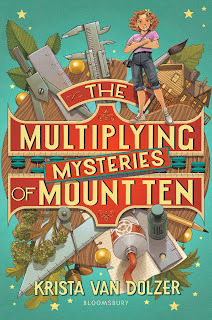 Jack soon discovers that he has an amazing ability, one that could make him the savior of Imagine Nation and beyond–or the biggest threat they’ve ever faced. 1. The Imagine Nation – To start with, just say that out loud. So clever. But it gets even better. The Imagine Nation is a kid’s dream world. It pulls together all the things kids–well, mostly boys–dream about being. Ninjas. Comic book superheroes and supervillains. Medieval warriors. Intelligent, feeling robots. Aliens. When I first read it, I thought, why didn’t anyone think to combine all of these before? It sounds crazy, but it works. 2. Jack himself – I’ll be honest here. Sometimes Jack drove me crazy taking forever to figure out what he needed to in these books. But then, if the hero figured it all out right away, there wouldn’t be much of a story, right? Jack does have a special power, and while his particular power is unique, the fact that he has a power is expected in the Imagine Nation, so it’s not a typical Chosen One story. His power does make him the ideal hero to fight the particular enemy facing the nation in this trilogy, but he still couldn’t do it alone. I’m going to share a passage from the final book that is a great example of Jack’s growth without giving away any of the actual plot. 3. The adventure – “Wow” is all I have to say about the first fifty or so pages of THE END OF INFINITY. I chatted back and forth with Matt Myklusch on Twitter several months ago, and he said the last book would be full of action, and man, did he deliver. It goes straight from an escape to a space fight a mob to a crazy chase scene through the capital city before things finally calm down for a bit. It’s the kind of book you could see playing out in a movie. The first two books had their share of adventure, but this one takes the cake. 4. The twists – There’s a great combination of twists you expect and twists that seem to come out of nowhere, and this happens in all three books. Some of them have the seeds planted early in the story, so when they happen you think, “of course.” Others, though, are surprises because the book is told entirely from Jack’s point of view. If he hasn’t been exposed to the clues, there’s no way the reader would know them either. I really like it when an author handles things this way. Sometimes books told in multiple POVs give too much away and the tension lags. 5. The endings – Although the first book wrapped up pretty well, it still left several things dangling. The second one was a total cliffhanger. The third one wrapped up all the major plot lines, but even this one left a window open for more Jack Blank stories. I’m going to quote something from the acknowledgments because I found it interesting as a writer, particularly since I posted on endings a couple of weeks ago. Well, Matt Myklusch has two fans in this house, so we’ll be anxiously awaiting whatever he writes next. Have you read this series? If not, go get it! For querying writers, Matt Myklusch is represented by Chris Richman of Upstart Crow Literary. No, I haven’t read this series. I do remember shelving the first book when it was called Jack Blank and the Imagine Nation. Funny, isn’t it, how the publisher decided to change the title? Maybe it wasn’t selling? 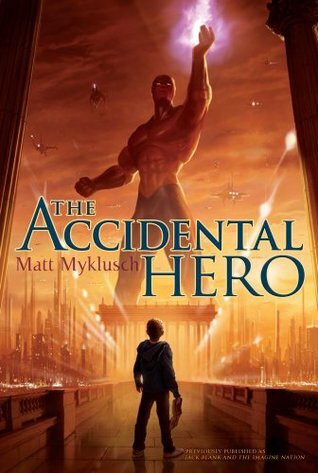 I like The Accidental Hero better as a title anyway. Thanks for the enthusiastic recommendations, Michelle, and for not spoiling the first two. It seems to me Matt Myklusch did a post somewhere about why the title changed, but I can’t lay my hands on it. I liked the first title, but I bet the newer title could attract some older readers, too. It sounds a bit less MG, and the cover is quite appealing. Hope you check these out! Sounds like a great series! Thanks for sharing. I’m always on the lookout for good books. I highly recommend this one, in case that wasn’t already clear :). Hope you check it out! This is a great review. I’ll have to add this series to my TBR list. (It sounds like something my husband might enjoy too. We’re geeks together.) It’s also nice to find another adult who enjoys reading MG fiction. If a book is well written, I’ll read MG and YA as happily as adult fiction. Yes, I’d definitely recommend it for your husband. As you read, mine loves it! I got into reading MG because I had a story idea to write an MG, but now it’s what I read most of the time. When I do read an adult book, I wonder when it’s going to end. I’ve gotten used to the shorter books. I love the way you can mix genres in an MG or YA since they’re only separated out by age in bookstores. So many opportunities!